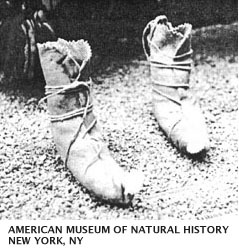 "The brain-tanned skin, which has not been dyed, becomes very hard and stiff when wet unless it is continually worked over and kept soft by manipulation, but skins which have been prepared by tanning with mangrove bark are very little affected by rain, and make very pretty leggings and moccasins. 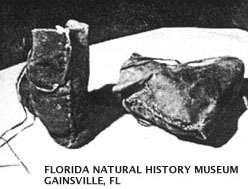 There are some very rare examples of beaded Seminole moccasins, but they do exist. 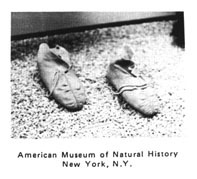 There are two pairs displayed in the Field Museum, Chicago, the Smithsonian formerly had a pair (and a photo of those is still available), and a pair loaned by the University of Pennsylvania was displayed in the "Patchwork and Palmettos" exhibit the summer of 1990 at the Ft. Lauderdale Historical Society. 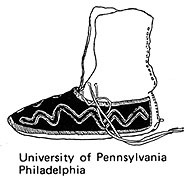 In all but one example, the beadwork was done on a red or dark blue wool "saddle" which was then attached to lay over the top and sides of the moccasin. The designs were usually simple uneven zigzags in white and one or two colors of beads, especially old rose pink. 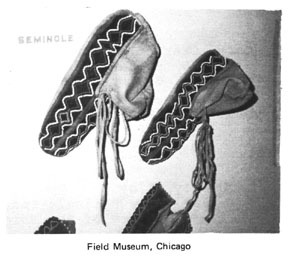 There is one odd example beaded directly onto buckskin, at the Field Museum (not pictured). 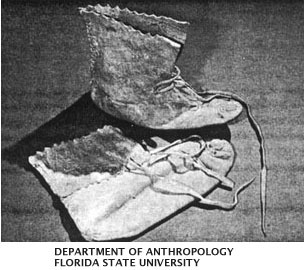 It may not be Seminole as identified, because other aspects of its construction are atypical. 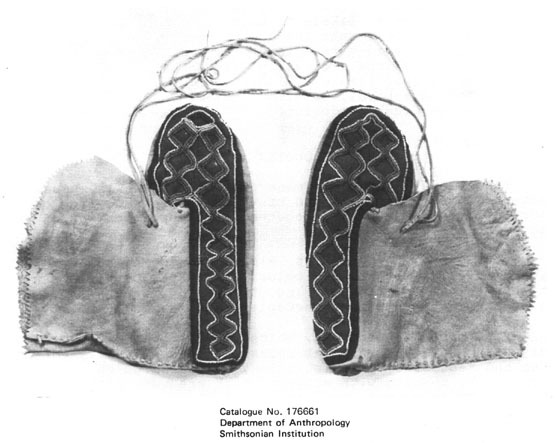 Creek moccasins used very thin sinew or thread to close up the front seam and almost never show a toe tab. They are more likely to be worn with the tops rolled down, more likely to be beaded, and more likely to have been beaded directly onto the buckskin, instead of onto a "saddle." Creek beadwork designs are easily more elaborate than simple Seminole zigzags, and have parallels with motifs seen on Creek bandoliers.